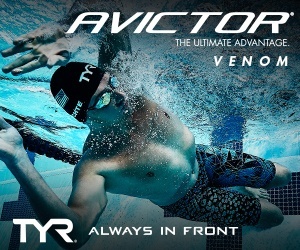 Courtesy of Barry Revzin, resident SwimSwam stat-fiend. 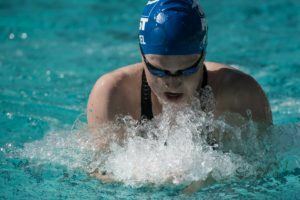 Watching Adam Peaty swim breaststroke, Katie Ledecky swim distance, or Sarah Sjotrom sprint fly, you can’t help but be amazed at just how far ahead of the rest of the world they are. 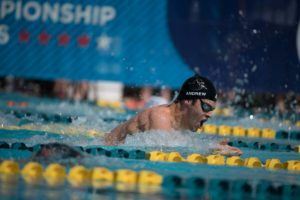 Their dominance is at this point a foregone conclusion – they are racing the clock, the rest of the field is racing for silver. 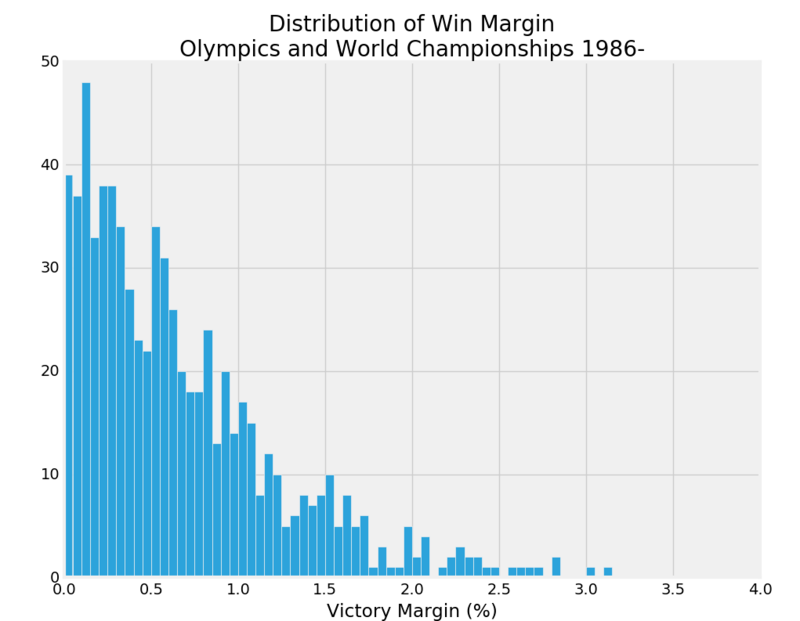 But while they may not have another competitor in the pool, I thought it might be interesting to take a look at a different kind of competition: history. 0.3% is a close but visibly clear win, like Chad le Clos in the 200 fly (0.34%) and Federica Pellegrini in the 200 free (0.39%). 1% is a convincing win, like Sun Yang in the 400 free (1.10%) and Sarah Sjostrom in the 100 fly (1.16%). 2% is basically a race for second place. This is where Adam Peaty in both the 50 (2.00%) and 100 (2.25%) breaststrokes, and Katie Ledecky in the mile (2.01%). Close wins are pretty common, and there is a pretty steep, rapid drop off. About one in four races had a margin as high as 1%, only about one in ten hit 1.5%, only one in forty hit 2%. Pretty interesting list! Leisel Jones twice in the top 10. Michael Phelps three times in the top 10 (granted, twice as the winner, and the third time as the distant silver-medalist to Crocker’s then-world record swim in Montreal). Surprisingly, despite Ledecky’s regular dominance, she hasn’t quite cut the top ten. 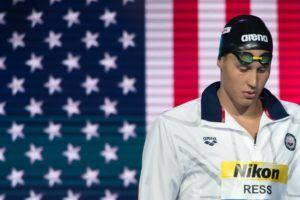 Her largest margin of victory, the 800 free at the Rio Olympics, was “just” 2.3%, 15th on the list. Adam Peaty came pretty close this week to getting himself another entry in the top ten. 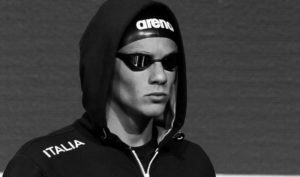 After the semifinals of the 50 breast, he was seeded a whopping 2.74% ahead of Felipe Lima. He still won by 2%, but will have to wait until the next meet to crack this list. Even Ledecky’s mile, where she was so far ahead that for a while the camera crew just gave up on her and starting showing the race for second instead, even that swim just wasn’t a big enough win. The women’s 800. Ledecky is seeded 2.3% ahead of hometown favorite Boglarka Kapas. This will be Ledecky’s last swim of a long meet, and she is the prohibitive favorite for the gold. But how prohibitive? The women’s 50 fly. As amazing as Ledecky and Peaty have been in their respective spheres, when it comes to the 50 fly, Sarah Sjostrom is practically a video game. Sjostrom is seeded 24.76 (a time that would have finished 3rd at US Trials in the 50 free). The second seed, Japan’s Rikako Ikee, is all the way back at 25.51. That’s a margin of 2.94%. But, as absurd as it may seem to say, 24.76 seems like a very conservative. 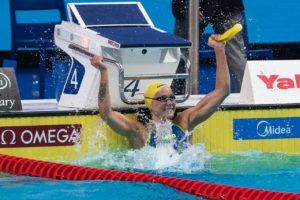 After nearly breaking her own world record in the 100 fly and obliterating the world record in the 100 free, it seems like a better than average bet that she would approach her world record of 24.43, set back in 2014. If she does so, that puts her well over 4% ahead of Ikee. I, for one, can’t wait to see what happens. Was Mary Meagher’s 2:05 2Fly before 1986? Plus, that was at U.S. Nationals, which would not qualify for this list anyway. Right, her Olympic swims in 1984 would not have made this list, and her swim in 1988 was a bronze. I have no idea how she did at 1986 worlds. At 1986 Worlds she went 2:08.41, winning by about two seconds. At 1982 Worlds she actually lost to an East German. Her margin of victory in LA ’84 was 3.66 seconds (2:06.90 to 2:10.56), which is roughly a 2.8% margin of victory, which would actually make this list (were it not ’86 and beyond). Awesome article, really interesting stuff. Will be fun to see if Sjostrom can top the list in the 50 later this week. I think lochte would be on the list multiple times if it were not for phelps. And phelps would probably have more entries if it was not for lochte.